You know what they say: when it rains, it pours. 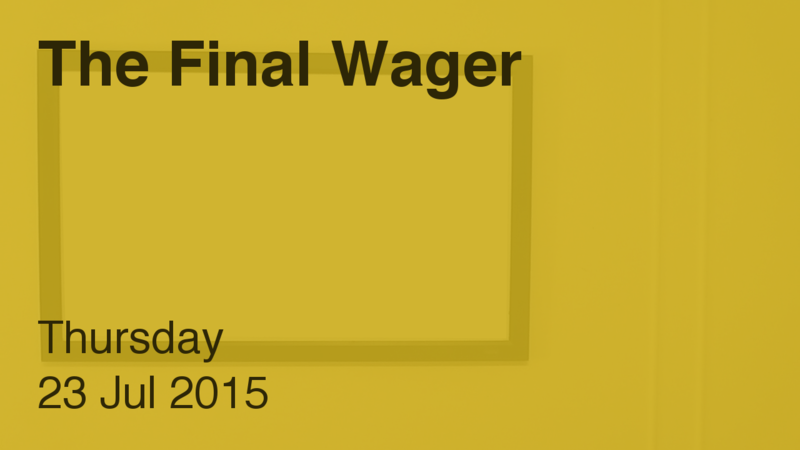 For the second time this week, I’m giving out a gray wager. This one is far worse than the first; at least that was “just” a miscalculation. It’s nice when you have round numbers because you can easily see who stands where. But yet, some people don’t know what’s best for them. Either way, it didn’t matter. Scott has now won 4 games and $93,402. And now I’m off to drink. More. You’ll get a video when I damn well feel like editing it. What is Brigham Young University? Thankfully for Erin’s conscience she wouldn’t have won even if she hadn’t botched the spelling and made a silly wager. I thought she played a decent game otherwise.